Ha ha! So I start several at a time now. Anyway, here goes… and I think I have a progress photo for almost everything. Sorry these photos are not very pretty. 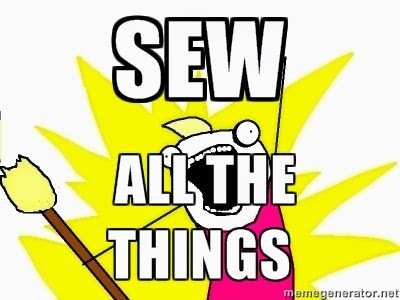 I just walked around my sewing room snapping pictures of WIPs. Think of them as the “before” shots. Hopefully there will be loads of great “after” shots in the next three months. 1. My 2011 Fat Quarter Shop Designer Mystery Block of the Month. I have two more blocks to sew (one of which I cut out this afternoon) and then I can start working on the flower stems in the finishing kit. I am saving all my scraps for my Farmer’s Wife quilt which I am starting over from scratch. I know that quilt won’t be finished this quarter though. Why am I starting my Farmer’s Wife quilt from scratch? Because I didn’t print the templates at the correct size which I thought I would be okay with but I am not. Also, I decided to sew it scrappy and I after 20 blocks I knew I didn’t like that. So matchy matchy it will be. I’ve let this idea percolate for a few years now. 5. A cherry and strawberry low volume baby quilt. Probably for my Etsy shop. 6. My table runner made with scraps from the napkins and place mats I made a few years ago. 7. My Halloween quilt using the “Lucky” pattern by Thimble Blossoms. 8. My Spring Fling mini quilt for the Spring Fling Mini Swap. 9. My summer picnic quilt. I just pressed and trimmed the blocks last night. 10. My April Showers “Charm Dash” quilt. 11. A dinosaur baby quilt for my Etsy shop. 12. A bugs baby quilt for my Etsy shop. 13. My Starflower quilt made with blocks from “We Bee With It” bee. 14. My Houndstooth quilt made with blocks from “The Bee Hive, Bee Hive Swarm Anita”. 15. 2012 Fat Quarter Shop Designer Mystery Block of the Month. I have four more blocks to go and I am using the scraps from this quilt for my Snapshots quilt (which may be done in Q4). 16. My Great Granny Squared (by Lori Holt) quilt. 17. My Swoon quilt. I’ve had this kit since the pattern came out! 18. My Cotton Blossoms table topper from Camille Roskelley’s first book. 19. Peter Rabbit baby quilt. 20. Joy Christmas wall hanging designed by Gnome Angel. 21. My Cotton + Steel Scout quilt. All strips are cut. Just need to sew! 22. My Cotton + Steel mini quilt for the Cotton + Steel mini quilt swap. I'm so glad to see a list as long as mine! Good luck with your beautiful projects! Wow, lots of projects on the go! In your houndstooth blocks I see cursive fabric. Can you tell me where you sourced this fabric? It is comforting to know I am not alone Emily! 🙂 I commented on your blog as you are "no reply". Thank you so much! I will need luck. 🙂 And I'm pretty sure some of these will be moving over to the third quarter of the year but I will try. You've got so many great projects in the works. Just think how satisfying it will be to check things off your list over the next three months. You will never leave your sewing room. lol That's one long list. Just start one, finish it and move on. Good luck. Love the cartoon at the end of your post. Reminds me of someone I know – yep me. You've made a lot of progress on most of those works in progress! One thing at a time. I, too, used to have only one project on the go and now have a few. There's just so much beautiful fabric and so many ideas. 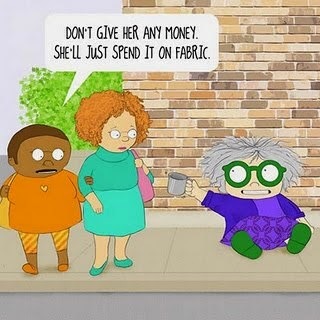 I feel you on the expensive fabric habit…I'm hoping to make some patterns from my quilt designs to sell. Oh, and I've probably said this before, but I just love that sewing machine block!!! Well you have choice which means chance of more finishes as I see it 😉 Good luck! Exactly! 🙂 There were several projects that I finished in Q1 but they didn't count because I didn't have them on my goals list. Thank you for visiting today. I think I fixed it!!!!! Thanks for the help! I love your Chicopee quilt, and many others. From what I can see, you made the chicopee collection work.